Beautiful villa dating back to the 18th century composed by a “Leopold style” farmhouse and 3 barns accurately restored for creating a unique complex and situated on the top of a hill in absolutely quiet position with panoramic views on the surrounding countryside. The furnishings are accurate and comfortably equipped. This property is suitable for weddings and special events. Prices refer to the rental of the whole property. Distances: Bettolle with food shops 1 km, Montepulciano approx. 18 km, Cortona 20 km, Siena 50 km. At guests’ disposal: large and fully equipped garden, 2 private swimming-pools, one oval shaped (4 x 10 m – open from 01/05 to 31/10) and a second pool (16 x 6 m – open from 01/05 to 31/10) both set in panoramic location with views over the Chiana Valley, large gazebo, wood-burning oven, barbecue (usable only if the property owner is present and to be paid on site), solarium, bathroom with hot water. Laundry room with washing machine and ironing facilities (to be paid on site). Air-conditioning is provided in all of the bedroom and in the main living area. Extra services to be paid on the spot: extra maid service and cook service are available on request. Laundry. On request possibility to hire an extra bed at € 25,- / per day and a baby bed at € 10,- / per day (payment on the spot). By arrangement it is possible to organize traditional Tuscan cooking classes. Ground floor: very large living room (TV-sat., Hi-Fi, CD), dining-room and winery (bar corner), 2 WC. 1st floor (access from outside): large living room with fireplace, 4 double bedrooms each with ensuite bathroom with shower. 2nd floor: suite with double bedroom (frigobar) with ensuite bathroom with shower. Ground floor: living room with dome vault with fireplace, kitchen corner (oven) and dining area, bathroom with shower, double bedroom. Antico Forno has a gazebo and a private swimming pool. Ground floor: living room with fireplace, kitchen corner (oven) and dining area, double bedroom, bathroom with shower. Private furnished outdoor area. Ground floor: living room with kitchen corner (oven, dishwasher) and dining area. 1st floor: 2 double bedrooms each with ensuite bathroom with shower. 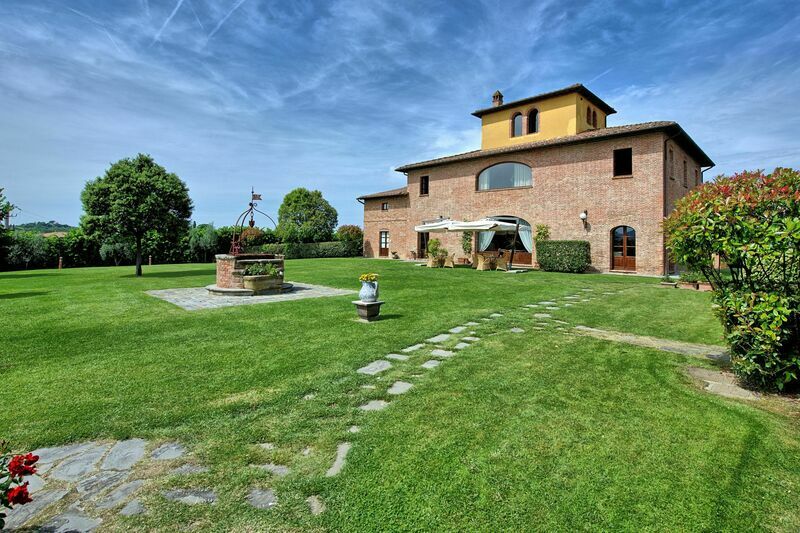 Private furnished terrace with beautiful panoramic views on the surrounding countryside.